Due to a lack of interest in learning, students were mostly irregular in attendance and results were disappointing at the end of the academic year. In an attempt to upgrade education levels and improve and transform teaching methods, we have engaged with various organizations which has increased enrollment and students’ interest in learning here. Three teachers, Naheed, Tania and Sakeena, from the GGPS Abdul Wahid Colony took part in a series of Teachers’ Trainings in 2017 and 2018 under Community World Service Asia and Act for Peace’s Girls Education Project. Naheed also participated in the Masters Teachers’ Training in February 2018. As an indicator of progress and as a result of the capacity building trainings, Sami shared an example of Tania’s two students of class five. Students who were previously disengaged and irregular have been participating in class very actively since the teachers’ training and the new methods introduced in the classroom. Ayesha, a nine-year-old student of class five, wants to grow up to be a doctor and provide medical treatment to people of all ages. shared Ayesha. Ayesha was a quiet student in class, but confidently participated in extracurricular activities. According to Sami, as Tania introduced new teaching methods involving role play, story-telling and group activities, Ayesha became more interactive and vocal in classroom sessions as well. Kashi, another grade 5 student, wishes to become a Police Officer when she is old enough and defend her country from criminals hurting the people of Pakistan. confidently added Kashi. Kashi’s favorite subject is Science. Miss Tania conducts group activities which makes it easier to understand. In a recent classroom session, while learning about States of Matter, Miss Tania drew a circle on the floor. All the students were called inside the circle. Since the circle was not very big, we were standing very close to each other. Miss Tania explained that we are in a solid state where molecules are close together. She then told us to move a little away from each other, to demonstrate the liquid state of matter. Likewise, she explained the gas state by spreading us all around the classroom, far away from each other. She teaches us through story-telling as well. For many students, science is a difficult subject, but through interactive activities, science has become easy and interesting to learn. Kashi and Ayesha were excited to talk about the concept of “Morning Meetings” recently introduced by the trained teachers in GGPS Abdul Wahid Colony. Kashi was not a regular student. Her parents switched her schools often. expressed Kashi. Kashi initially was enrolled in GGPS Abdul Wahid Colony in class one with her elder sister, who was then in class four. She left and joined a boys’ school after a year. Keeping schools clean can help prevent students from falling ill and reduce absenteeism, giving students a better opportunity to stay on track with the curriculum. According to researches, people are generally happier and more productive in a clean work environment. 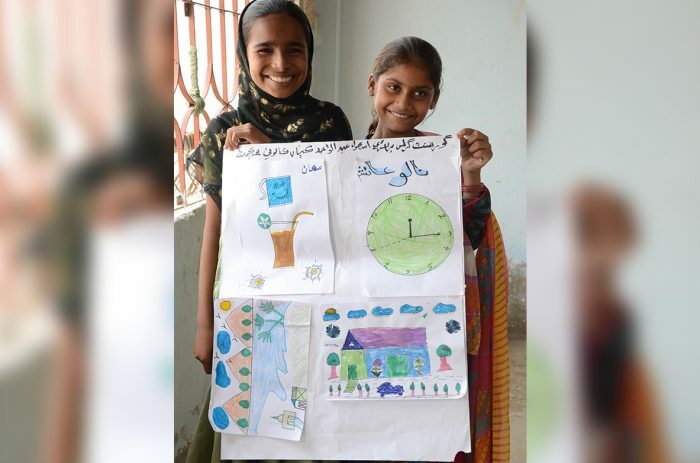 A Creative Art Competition was organized in Umerkot on May 12th this year under the Girls’ Education project. The activity aimed at strengthening creative skills of students by providing them a competitive platform to present their artistic abilities. A total of forty-three students and fourteen teachers from eleven different schools participated in the competition. The competition activities were categorized in three segments; Oratory skills (Speech, Poem recitals and skit performance), Creative Visual Arts (such as Drawing & painting) and Innovation, in which any new teaching methodology was introduced through a demonstration. expressed Kashi with great excitement. Ayesha also took part in the Recitation competition. According to Sami, Ayesha delivered her recital with complete confidence and motivation.